A tool that gives you full control of the process via serial port. - DNC Precision is a communications program specially developed to exchange data and programs between a computer and any Numerical Control (NC) machine. The program makes it possible to send and receive programs written in the machine language. - It is necessary to have at least one free serial port, not occupied by any other device (for example, mouse), to connect NC controllers. 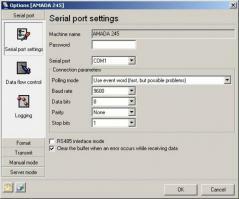 - serial ports assigned for querying are used exclusively by the program. While the program is running, they cannot be used for any other purposes. Although the work of the program can be interrupted manually if necessary. Open and close your CD-ROM drive with one click.